Autumn. This word fills my senses with a multitude of pleasant sensations – the crisp bite of the morning air, the crackle of the leaves beneath my feet, and the rainbow of colors painted across the trees. With the start of school and soccer, the kids look forward to spending more time with their friends (and less time with those fuddy-duddies known as Mum and Dad). Close-knit friendships bring plenty of joy to their lives… and plenty of germs into our home. Besides telling the filthy little munchkins to wash their hands and keep their fingers out of their noses (sigh), there is not much I can do about the onslaught of creepy crawlies. So, I do what any self-respecting food-obsessed mother would do. I make soup. Batches and batches of it. 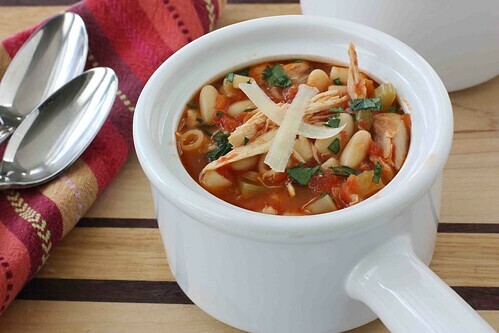 This healthy soup is a hearty mixture of chicken (I used rotisserie chicken for ease), cannellini beans, vegetables, and pasta. It requires a small amount of chopping and then some inactive simmering time. In other words, it comes together with very little effort. Along with my Crockpot Chicken, Black Bean & Chipotle Pepper Soup, this will be a meal that we are sure to enjoy many times over the cold-weather months, in sickness and in health. Heat 2 teaspoons olive oil in a large saucepan set over medium-high heat. Add 1 large shallot, minced, 2 medium carrots, cut into half-circles, and 2 large stalk celery, cut into 1/2-inch pieces. Saute until the vegetables are beginning to soften, 2 to 3 minutes. Add 1 can (28 ounces) whole tomatoes, finely chopped, with juices, 5 cups low-sodium chicken broth, and 2 bay leaves. Bring to a boil, then lower heat to medium-low, partially cover, and simmer for 20 minutes. 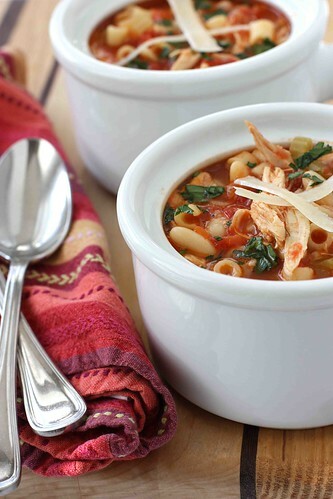 Uncover the soup, remove the bay leaves, add 2 cups chopped cooked chicken, 1 can (15 oz.) cannellini beans, and 1/2 cup ditalini pasta (small, short tubes). 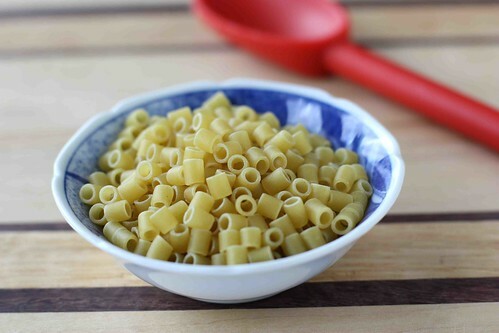 Increase the heat to medium-high and cook until the pasta is al dente, about 10 minutes. Season with salt and pepper, add 1/4 cup finely chopped fresh parsley and 8 leaves fresh basil, thinly sliced. Garnish with grated Parmesan cheese. Serve. Heat olive oil in a large saucepan set over medium-high heat. Add shallot, carrots, and celery. Saute until the vegetables are beginning to soften, 2 to 3 minutes. Add chopped tomatoes with juices, chicken broth, and bay leaves. Bring to a boil, then lower heat to medium-low, partially cover, and simmer for 20 minutes. Uncover the soup, remove the bay leaves, add cooked chicken, beans, and pasta. Increase the heat to medium-high and cook until the pasta is al dente, about 10 minutes. Season with salt and pepper, add ¼ cup finely chopped fresh parsley and 8 leaves fresh basil, thinly sliced. Garnish with grated Parmesan cheese. Serve. Wishing it was "soup season" here but alas, it's still too warm!! 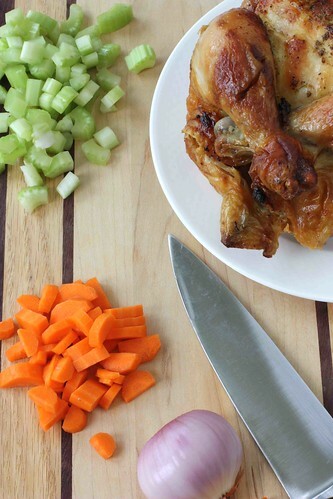 This is a great "second use" for a chicken and makes this soup an easy, weeknight dish!!! Hope everyone gets well soon! Soup cures everything!! Looks beautiful! Ah soup! I've been thinking a lot about it, but haven't made any yet. 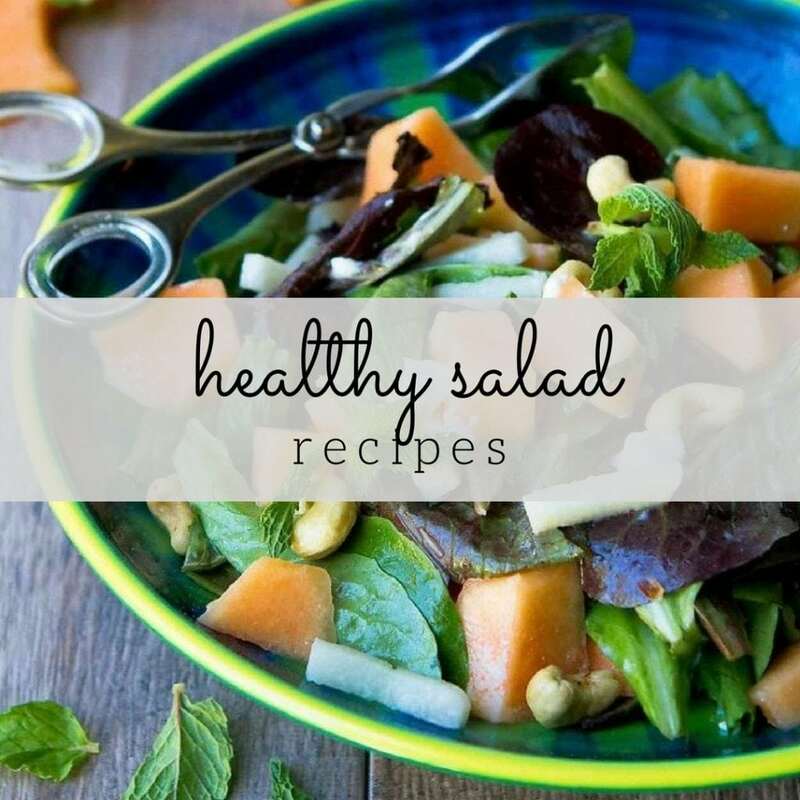 The picture just makes you want to try this, what an inviting bowl of healthy fabulous goodness! love it! I love soup and this one looks wonderful. What would I do without Rotisserie Chickens? They save me several times a week! Thanks for these soup recipes. It's that time of year! That looks sooo nummy! As soon as it cools off here I will be making that on Sunday 🙂 PS: Love your new look!! Two of my favorite colors Blue & "Red"
This looks like a great recipe for a busy day. Simple but with lots of flavor. I can't wait for soup season to come around. We've had a couple cool days but not consistent yet. Like the new header, too! I am a soup freak! As soon as the weather cools, I retrieve all my old favorite soup recipes, but always on the hunt for new ones. I am intrigued by your recipe and can't wait to try it. I have bookmarked it, I know our family will love this. Any self respecting germ would be vanquished for life with this delicious soup in the table. your blog looks beautiful! i really like the new look. congratulations on your makeover and lovely site. this soup also looks fantastic and perfect for crisp fall weather… i love fall! bring on the soup. Perfect for the fall. Love this kind of soup…lots of goodness in it. Now, if Atlanta weather would just decided to get cooler, that would be great!! 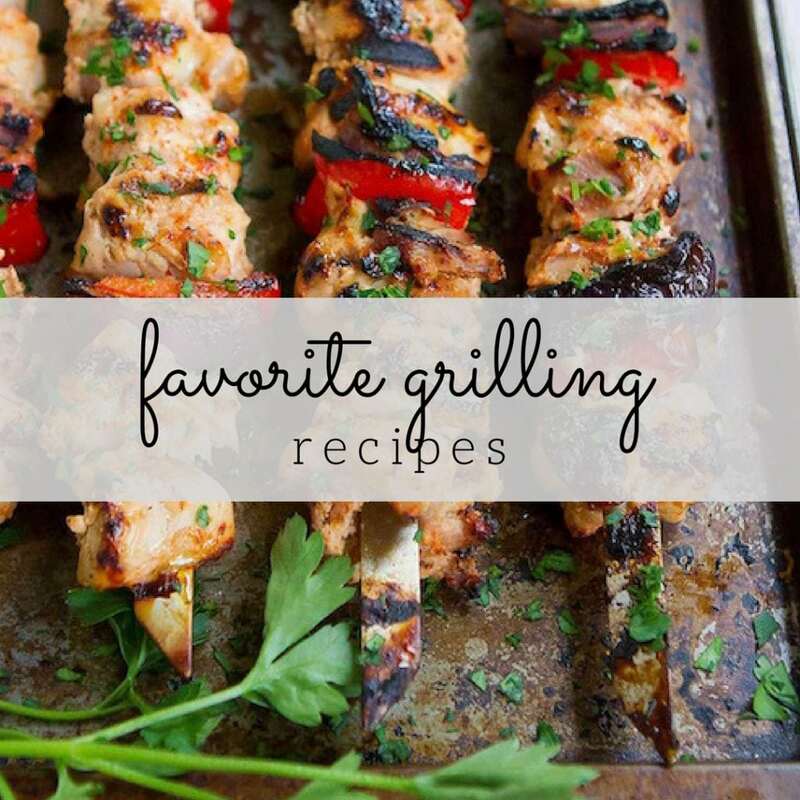 The banner and the recipe look great…. I have plenty of soup making days ahead of, mine start pre-school this year and the real thing next year. Thanks Dara, I love soup recipes, I'm saving this one, I like the pre-cooked chicken idea. A healthy and delicious soup. I like it. I need to cook more of this type of soup as the weather starts getting colder. You are making me crave for a soup even if it's not completely soup time here! Uh and beautiful redisign of the blog. I really like it! I love making and eating soup in the fall. This recipe looks like a real keeper! Yes, the start of school always means someone's gonna be coming down with a cold. Soup's the perfect cure and yours looks delicious. 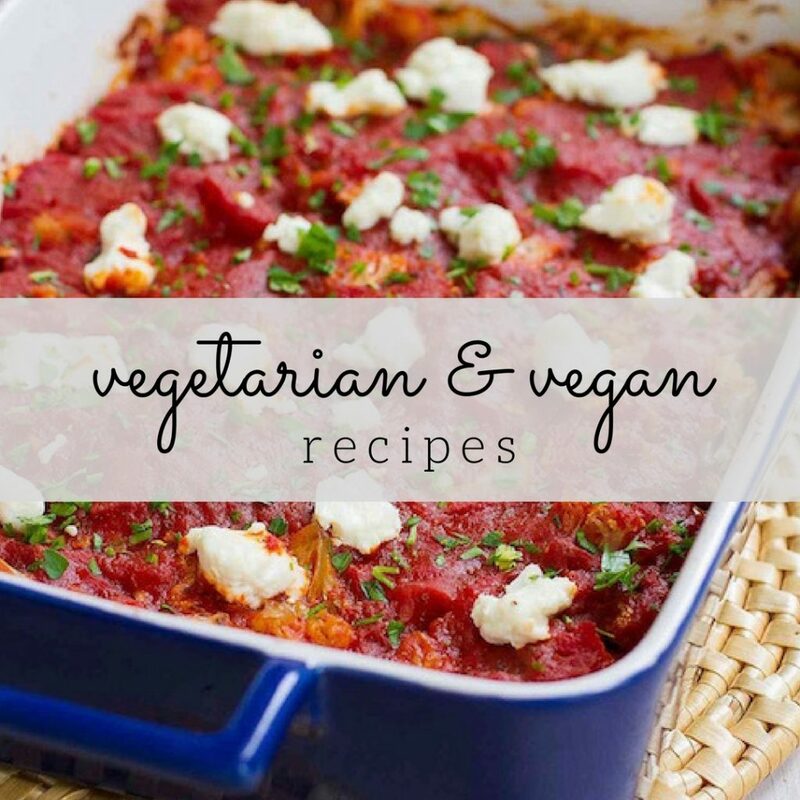 Great photos and a great recipe. Does your blog look different? Am I going crazy? The soup sounds wonderful for those cold days of autumn and winter. We are still in the 80s here in the high country of Arizona, but by October, the evenings should be cool enough for this lovely soup. LOVE the new, fresh look of your blog – but of course, I loved the other one, too. I can't wait until cooler weather comes around because we are soup fanatics. This one will be first on the menu as soon as we hit something other than iced tea weather. LOL! Great post! Love the new blog look–I'm working on a new look myself! This soup loos perfect for fall, so hearty! I've made several of your recipes over the last few weeks and they have all turned out wonderfully. You are wonderful cook. I am ready for soup season! LOVE the new look Dara! Oh my goodness…your new design is just gorgeous! I popped over because I am unveiling my new site design later today and I was updating my blogroll to add you. The soup looks marvelous, too- perfect for fall and keeping away the creepy crawlies, as you say! Your new look is fantastic – especially love the maple leaf in Canuck 🙂 Love a delicious soup with plenty of veggies! This is fantastic! WOW! I think I would have to have a second helping of this! What a wonderfully hearty and rustic soup. Perfect for fall! This looks SO good! I'm so excited that it's soup season. 🙂 Also, I love the new look of your blog! Lovely! The simplicity of your photographs is stunning. I was drooling after each new shot. Thank you for sharing such a warm and flavorful rustic soup. I would love to serve this with a large and crusty loaf of bread. Love this combination and the soup photo. Your updated sight is fabulous!! Dear Dara – Aah the scents of soup and such wonderful weather for it. Such gorgeous photos! Soup looks wonderful and tummy warming good! Looks so yummy! I'm so happy soup season is coming. This soup would be perfect for those cooler days. I love the new look of the site! Beautiful! This hearty, healthy soup looks wonderful. Fall hasn't arrived where I live, darn it, but I'm very much in the mood for soups and stews such as this. A steady round of summer BBQ and salads is getting to be old hat. Your pictures have me wanting to reach into my screen and grab a cup of soup. Lovely! I made this soup for dinner tonight (have had it on my "to make" list ever since you posted it. It was delicious and very easy to make! I used rotisserie chicken and a quart of tomatoes that I canned last fall. My 8-year old son exclaimed that he loved it and it's now his second favorite food (behind mac & cheese)! Thanks again for all of your comments. I truly appreciate each of you taking the time to write a note. Shannon – Thanks so much for letting me know that you and your family enjoyed this soup. Please tell your son I am honored that the soup made it near the top of his "favorite" list. What a beautiful looking soup! Sounds so easy and tasty too. made this soup over the weekend and it was FABULOUS!!!!! thank you!!!! BRRRRRRrrrr it's a cold wintery blustery day here (windchill = -21C, ouch!) so I cooked up a pot of this soup with a couple of changes based on ingredients I have on hand (turkey instead of chicken and barley instead of pasta) – it smells and looks delicious 🙂 I'm making grilled cheese sandwiches to go along with it – thanks for a great recipe! I made this for my beau Carlos and I and Carlos absolutely loved it (so did I as a matter of fact). Your recipes are always a huge hit with him. Looks delicious & beautiful! Thanks for sending us the link!